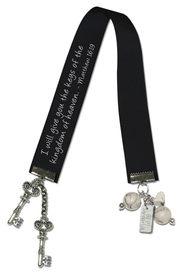 Gifty ribbon bookmark, black ribbon with white imprint: Matthew 16:19 I will give you the keys to the Kingdom of heaven. Tipped with metal tabs, and charm dangles: keys at one end and bead and Scripture charm at the opposite end. An elegant way to mark your place in book or Bible.